Tritium (chemical symbol T or 3H) is a radioactive isotope of hydrogen. The nucleus of tritium (sometimes called a triton) contains one proton and two neutrons, whereas the nucleus of protium (the most abundant hydrogen isotope) contains one proton and no neutrons. Tritium emits low-energy beta radiation that cannot penetrate human skin, so this isotope is dangerous only if inhaled or ingested. The properties of tritium make it useful for various applications. For instance, it is used in some self-illuminating watches, compasses, key chains, and gun sights for firearms. It is occasionally used as a radioactive label in molecules to trace their reactions and biochemical pathways. It is widely used in nuclear weapons for boosting a fission bomb or the fission primary of a thermonuclear weapon. Tritium is also an important fuel for controlled nuclear fusion reactions. The existence of tritium was first predicted in the late 1920s by Walter Russell, using his "spiral" periodic table. It was produced in 1934 from deuterium, another isotope of hydrogen, by Ernest Rutherford, working with Mark Oliphant and Paul Harteck. Rutherford, however, was unable to isolate tritium, a job that was left to Luis Alvarez and Robert Cornog, who correctly deduced that the substance was radioactive. Willard F. Libby discovered that tritium could be used for dating water, and therefore wine. Each such reaction produces helium-3, an electron, and a nearly undetectable electron antineutrino, along with about 18.6 keV of energy. The electron has an average kinetic energy of 5.7 keV, while the remaining energy is carried off by the electron antineutrino. Although experiments have indicated somewhat different values for the half-life of tritium, the U.S. National Institute of Standards and Technology (NIST) recommends a value of 4500±8 days (approximately 12.32 years). The low-energy beta radiation from tritium cannot penetrate human skin, so tritium is dangerous only if inhaled or ingested. This low energy makes it difficult to detect tritium-labeled compounds, except by the technique of liquid scintillation counting. Because of tritium's relatively short half-life, however, tritium produced in this manner does not accumulate over geological timescales, and its natural abundance is negligible. In nuclear reactors, tritium can be produced by the neutron activation of lithium-6, using neutrons of any energy. The reaction is exothermic, yielding 4.8 MeV of energy, which is more than one-quarter of the energy that can be produced by the fusion of a triton with a deuteron. High-energy neutrons can also produce tritium from lithium-7 in an endothermic reaction, consuming 2.466 MeV of energy. This reaction was discovered when the 1954 Castle Bravo nuclear test produced an unexpectedly high yield. 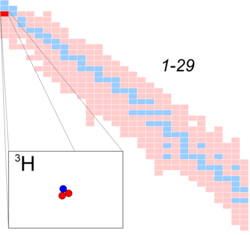 Reactions requiring high neutron energies are not attractive production methods. Tritium is occasionally a direct product of nuclear fission, with an yield of about 0.01 percent (one per 10,000 fissions). This means that tritium release or recovery needs to be considered in nuclear reprocessing even in ordinary spent nuclear fuel where tritium production was not a goal. Tritium is also produced in heavy water-moderated reactors when deuterium captures a neutron. This reaction has a very small cross section (which is why heavy water is such a good neutron moderator), and relatively little tritium is produced. Nevertheless, cleaning tritium from the moderator may be desirable after several years to reduce the risk of escape to the environment. Ontario Power Generation's Tritium Removal Facility can process up to 2.5 thousand metric tons (2,500 Mg) of heavy water a year, producing about 2.5 kg of tritium. According to the 1996 report of the Institute for Energy and Environmental Research (IEER) about the United States Department of Energy, only 225 kg of tritium has been produced in the U.S. since 1955. Given that tritium is continuously decaying into helium-3, the stockpile was approximately 75 kg at the time of the report. Tritium for American nuclear weapons was produced in special heavy water reactors at the Savannah River Site until their shutdown in 1988. With the Strategic Arms Reduction Treaty after the end of the Cold War, existing supplies were sufficient for the new, smaller number of nuclear weapons for some time. Production was resumed with irradiation of lithium-containing rods (replacing the usual boron-containing control rods) at the commercial Watts Bar Nuclear Generating Station in 2003-2005, followed by extraction of tritium from the rods at the new Tritium Extraction Facility at SRS starting in November 2006. Tritium has an atomic mass of 3.0160492. It is a gas (T2 or 3H2) at standard temperature and pressure. It combines with oxygen to form a liquid called tritiated water, T2O, or partially tritiated water, THO. All atomic nuclei, being composed of protons and neutrons, repel one another because of their positive charge. However, if the atoms have a high enough temperature and pressure (for example, in the core of the Sun), then their random motions can overcome such electrical repulsion (called the Coulomb force), and they can come close enough for the strong nuclear force to take effect, fusing them into heavier atoms. The same is true, albeit to a lesser extent, of deuterium. This is why brown dwarfs (so-called failed stars) cannot burn hydrogen, but they do indeed burn deuterium. This "gaseous tritium light source," about 1.5 years old, is a glass vial filled with tritium gas. The inner surface of the vial is coated with a phosphor, which glows as it is continually struck by electrons emitted by the tritium. Like hydrogen, tritium is difficult to confine. Rubber, plastic, and some kinds of steel are all somewhat permeable. This has raised concerns that if tritium is used in quantity, in particular for fusion reactors, it may contribute to radioactive contamination, although its short half-life should prevent significant long-term accumulation in the atmosphere. Atmospheric nuclear testing (prior to the Partial Test Ban Treaty) proved unexpectedly useful to oceanographers, as the sharp spike in surface tritium levels could be used over the years to measure the rate of mixing of the lower and upper ocean levels. The legal limits for tritium in drinking water can vary. Some figures are given below. Canada: 7,000 Becquerel per liter (Bq/L). World Health Organization: 10,000 Bq/L. European Union: 'investigative' limit of 100* Bq/L. The U.S. limit is calculated to yield a dose of four mrem (or 40 microsieverts in SI units) per year. 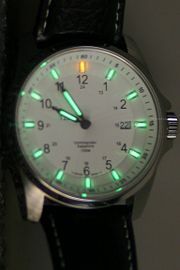 A watch face illuminated with tritium. 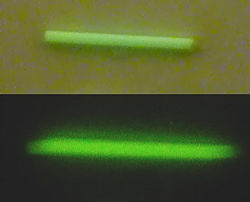 The electrons emitted by small amounts of tritium can cause phosphors to glow. This phenomenon is employed in self-powered lighting devices called trasers, which are now used in watches and exit signs. It is also used in certain countries to make glowing key chains and compasses. In recent years, the same process has been used to make self-illuminating gun sights for firearms, especially semi-automatic handguns. The tritium takes the place of radium, which can cause bone cancer. Such uses of radium have been banned in most countries for decades. According to the aforementioned IEER report, the commercial demand for tritium is about 400 grams per year. Tritium is sometimes used as a radioactive label in molecules to trace their reactions and pathways. Given that hydrogen appears in almost all organic chemicals, it is easy to find a place to put tritium on the molecule under investigation. The disadvantage of using tritium is that it produces a comparatively weak signal. Tritium is widely used in nuclear weapons for boosting a fission bomb or the fission primary of a thermonuclear weapon. Before detonation, a small quantity (few grams) of tritium-deuterium gas is injected into the hollow "pit" of fissile plutonium or uranium. The early stages of the fission chain reaction supply enough heat and compression to start DT fusion. Thereafter, both fission and fusion proceed in parallel, the fission assisting the fusion by continued heating and compression, and the fusion assisting the fission with highly energetic (14.1 MeV) neutrons. As the fission fuel becomes depleted and also explodes outward, it falls below the density needed to stay critical by itself, but the fusion neutrons make the fission process progress faster and continue longer than it would without boosting. Increased yield (compared to the use of fission fuel without boosting) comes overwhelmingly from the increase in fission; the energy released by the fusion itself is much smaller because the amount of fusion fuel is much smaller. Besides providing increased yield, tritium offers the possibility of variable yield, by varying the amount of fusion fuel. Perhaps even more significantly, tritium allows the weapon (or primary of a weapon) to have a smaller amount of fissile material (eliminating the risk of predetonation by nearby nuclear explosions) and more relaxed requirements for implosion, allowing a smaller implosion system. Because tritium in the warhead is continuously decaying, it is necessary to replenish it periodically. The estimated quantity needed is four grams per warhead. To maintain constant inventory, 0.22 grams per warhead per year needs to be produced. As tritium quickly decays and is difficult to contain, the much larger secondary charge of a thermonuclear weapon instead uses lithium deuteride (LiD) as its fusion fuel. During detonation, neutrons split lithium-6 into helium-4 and tritium; the tritium then fuses with deuterium, producing more neutrons. As this process requires a higher temperature for ignition, and produces fewer and less energetic neutrons (only D-D fusion and 7Li splitting are net neutron producers), LiD is used only for secondaries, not for boosting. Tritium is an important fuel for controlled nuclear fusion in both magnetic confinement and inertial confinement fusion reactor designs. The experimental fusion reactor ITER and the National Ignition Facility (NIF) will use Deuterium-Tritium (D-T) fuel. The D-T reaction is favored because it has the largest fusion cross section (~ 5 barns peak) and reaches this maximum cross section at the lowest energy (~65 keV center-of-mass) of any potential fusion fuel. ↑ L. L. Lucas and M. P. Unterweger (2000), Comprehensive Review and Critical Evaluation of the Half-Life of Tritium National Institute of Standards and Technology. Retrieved June 9, 2008. ↑ P. G. Young and D. G. Foster, Jr. (1972), An Evaluation of the Neutron and Gamma-ray Production Cross Sections for Nitrogen Los Alamos Scientific Laboratory. Retrieved June 9, 2008. ↑ 3.0 3.1 Hisham Zerriffi (1996), IEER Tritium Report IEER. Retrieved June 9, 2008. ↑ G. C. Jones, PRW Tritium Issues meetings.lle.rochester.edu. Retrieved June 9, 2008. ↑ Carey Sublette (2006), Section 12.0 Useful Tables Nuclear Weapon Archive. Retrieved June 9, 2008. ↑ 2005, Tritium (Hydrogen-3), Human Health Fact Sheet Argonne National Laboratory. Retrieved June 9, 2008. ↑ O. Serot, C. Wagemans, and J. Heyse (2005), New Results on Helium and Tritium Gas Production From Ternary Fission INTERNATIONAL CONFERENCE ON NUCLEAR DATA FOR SCIENCE AND TECHNOLOGY. AIP Conference Proceedings. 769:857-860. Retrieved June 9, 2008. ↑ 2008, The Canadian Nuclear FAQ - Section D: Safety and Liability Nuclear FAQ, Canada. Retrieved June 9, 2008. ↑ Fact Sheet SRS. Retrieved June 9, 2008. ↑ IEER Tritium Report IEER. Retrieved June 9, 2008. All links retrieved May 9, 2014. This page was last modified on 9 May 2014, at 14:24.